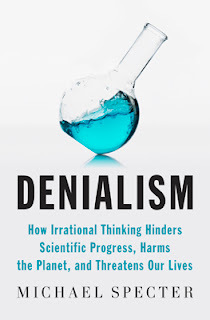 Just finished reading (actually listening, I love Audible.com) Michael Specter's new book Denialism: How Irrational Thinking Hinders Scientific Progress, Harms the Planet, and Threatens Our Lives. I highly recommend you give it a read, even if you are well acquainted with the history of the skeptics movement and most of the issues he covers. Specter weaves a convincing narrative sketching a brief history of science denial in western culture. How did popular culture shift from the pro-science zeitgeist of the 60's, with great achievements like the moon landings, to it being vogue to decry science based medicine? Interestingly, in a book about science denial he entirely jumped over the low hanging fruit of evolution. Why I cannot say, but I suspect he was more focused on recent incarnations of denial. While evolution is a modern hot topic, its origins are ancient and likely outside the scope of the book. The first chapter interested me greatly, as I was unfamiliar with the history of Vioxx. Specter argues that the scare created when we learned that a drug thought safe and FDA approved increased the chance of heart attack kickstarted denialism in popular culture. Science had just transformed from being the wonderful institution that went to space and captured our imaginations to the evil corporation's tool to risk our lives to increase their profits. While I suspect this is an oversimplification, Specter makes a convincing case that Vioxx was a linchpin in changing how society viewed science. As many skeptics will no doubt be aware, one of the first causalities of this newfound distrust of science was vaccination. 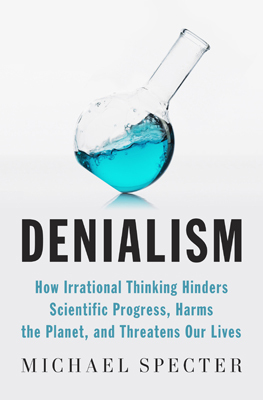 Denialism covers the anti-vaccine movement pretty well in chapter 2, though I did not learn much from this chapter. Likewise with chapter 4 on alternative medicine and natural remedies. But sandwiched between these stale slices, I was thrilled to discover a scathing critique of what can only be called the organic fetish. In my experience, organic food and the related distrust of "big agriculture" is a popular sacred cow even among skeptics. Undaunted, Specter strides through Whole Foods and overturns the moneychangers' tables with righteous indignation. The panic over GMO crops, farming chemicals, and fertilizers is largely based on a misunderstanding or lack of information about the reality of farming. Having grown up on a farm, I'm always impressed by the fact that I have yet to meet someone railing against the dangers of GMOs who could tell the difference between a planter and a cultivator. Organic fields in Minnesota are incredibly easy to spot, their the sparse, sickly looking ones with low yield and filled with more weeds than crop. The farmers still make a tidy profit though because people are willing to pay premium for an identical product with Organic stamped across the front. One critique I have, however, is that this book is clearly not written to reach deniers but rather their flocks. If Denialism was intended to change the minds of Organic believers directly, for example, I think it misses the mark. To the denier, it would surely read as a love letter to corporations because it dares to suggest that corporations are not fundamentally evil. In this respect it seems slightly schizophrenic. It is difficult to tell at times when Specter is parroting the narrative of denialists or spinning his own. Especially in the last two chapters on genetics in medicine and synthetic life, he trespasses on denialist territory himself, exhibiting many of the signs believer in reverse. Perhaps he is trying to stir up controversy by intentionally taking an unpopular position, but I doubt. So I encourage you to read the book and take what you read with a grain of salt. If you come away from the book believing everything he says, you have missed the message. Likewise if you come away disagreeing with everything he says, you may be the person he is writing about.